Confusion has prevailed since the beginning of civilization about who God is and what He desires of those who would trust in Him. The reason is simple. We all tend to have our own ideas based on our own reasoning, rituals, superstitions, traditions, and the influence and opinions of others. This includes people raised in churches and who read the Bible. This confusion is illustrated in the story of a Samaritan woman who encountered Jesus at an ancient well. When Jesus—the Son of God—engages her in conversation, her confusion about spiritual things is evident. When Jesus reveals what He knows about her, she responds with a challenge about religion. Jesus doesn’t mince any words. He tells her plainly, “You don’t know what you’re worshipping.” Sadly, this is just as true for many today as it was for this woman. The woman dismisses what Jesus says by changing the subject. This is a common tactic when a conversation about spiritual truth goes beyond our understanding. But Jesus keeps the conversation centered on what is spiritually true, as seen in how the story unfolds. God is a spirit. Those who worship him must worship in spirit and truth. What water does the Samaritan woman ask for and why does she want it? What does Jesus tell the woman to do and how does this result in a religious discussion? What does Jesus say about “true worshipers”? How are they to worship God and what do you think this means? How does Jesus respond to the woman’s comment about the Messiah? Discussions about religion are difficult for many reasons, especially when emotions are driven by opinions and ignorance that interfere with clear thinking. Terminology and traditions also contribute to confusion and fruitless debates that are more emotional than spiritual. As Jesus speaks of spiritual things—living water—the woman is focused on what’s immediate and physical. This illustrates what Jesus says about God and worship. Worship is neither mystical nor religious, but spiritual. True worship is based in a personal relationship with God not a specific action. When the woman dismisses what Jesus says to her about worship by speaking of the Messiah to come, Jesus reveals who He is to the woman. As the story continues, she appears to believe Him and what He says about God and true worshipers. God is spirit—spiritual in nature, not human in origin. He’s eternal—self-existent and above and beyond the natural world. True worshipers—those whom God is seeking—worship Him in a spiritual way rather than with rituals and traditions. True worshipers also worship Him in truth—according to what is revealed by God in His written word, the Bible. How does Jesus’ discernment about the woman’s marital status relate to what Jesus says about worshiping God? What is Jesus referring to when He says, “…salvation comes from the Jews”? When Jesus tells this woman He is the Messiah, how does this reveal who is included as the true worshipers God seeks? Meditate On This— God is spirit and we need to worship Him in spirit and truth in ways that are genuinely spiritual, that reflect His true nature, and are in agreement with the truth He’s revealed about Himself in the Scriptures. Prayer Focus— Practice times of quiet reflection before and after bringing your concerns, petitions, and intercessions to God in prayer. Ask God to help you understand how to worship in ways that please Him. It's important to read a story from the author's point of view—including their time and culture. If we don't see it from their point of view, we'll miss both essential and more subtle details. Here, Jesus and His followers are traveling from Jerusalem in Judea in the south to Galilee in the north. This causes them to go through the region of Samaria. The Samaritans were considered a mixed breed of people with a false religion by the Jews. The Jews were prejudiced against the Samaritans who responded with antagonism towards the Jews. Prejudice and mistrust between people groups have existed since ancient times. Jesus and the disciples stop in Sychar near Shechem at Jacob's Well. Jesus stays there while His followers go to town to buy food. When a Samaritan woman comes to draw water in the heat of the day, Jesus asks the woman for a drink of water. This in itself would be unusual, as revealed in the story (below), but their conversation takes an even more unexpected turn. Jesus knew that the Pharisees had heard that he was making and baptizing more disciples than John. (Actually, Jesus was not baptizing people. His disciples were.) So he left the Judean countryside and went back to Galilee. What are the specific details we're told about the situation in this story? What seems to be the turning point in the conversation between Jesus and the woman? How does the woman respond to the statements Jesus makes? What kind of water does Jesus offer and what do you think He means by this? Jacob's Well was hundreds of years old even in the time of Jesus and was quite deep. The region of Samaria was disputed land then as it is now. This is evident in the story by the woman's contentious responses to Jesus. But Jesus immediately flips the conversation by telling her she should be asking Him for a drink of living water. The woman doesn't back down. As Jesus so often did, He turns what seems like a typical conversation into an opportunity to reveal spiritual truth. He offers her living water—water that continues to flow like an artesian spring—giving eternal life. This conversation and the story continue, but we'll stop here to consider how Jesus turns a contentious situation into an opportunity to share spiritual truth. How do you typically handle or respond to contentious people and situations? We are not Jesus, but what can we learn from how He responded to the woman? How does Jesus describe what He has to offer her, and us, by shifting the conversation from a focus on the physical to the spiritual? Have you personally experienced what Jesus says about the living water He offers? Meditate On This— When we focus on the true need of a person, we can choose to see them through the lens of God's love. We can trust God's Spirit to lead us in how to turn mundane conversations into opportunities to consider eternal concerns. Prayer Focus— Ask the Lord each day to help you see the people you encounter as He sees them—who they are, their needs and life situations. Pray for wisdom and grace to turn everyday conversations into opportunities to share your faith. Dieting and weight loss have become a stand-alone industry. I'm amazed by the onslaught of ads and commercials everywhere I look—TV, social media, billboards. Physical fitness programs are often linked with specialized diets. I don't know why I'm amazed by all the focus on diet and fitness. It all lines up with our cultural obsession with self and appearance. Of course, even selling "healthy" junk food and trendy cars appeal to this obsessive focus. It's a paradox of sorts. Culturally, we honor self-sacrifice and service to others by first responders and military personnel, while we elevate the value of whatever promotes ourselves for our highest satisfaction. We're values-conflicted. Self-sacrifice and self-exaltation are two opposite values. I use to hear people say, "America is a Christian nation" or that we have a Christian heritage. Not so much anymore. Perhaps one reason is our values conflict. As a Christian—a follower of Jesus—exalting our self isn't just a paradox, it's the exact opposite of Jesus' call to follow Him (Matt 16:24). Concerned about your diet? How about a self-diet? It's the diet John the Baptizer was on, along with Jesus. What prompts John the Baptizer's disciples to question him about Jesus? What seems to be bothering John's disciples about Jesus? How does John answer the concerns of his disciples? What does he tell them? In what way does John say he needs to decrease while Jesus increases? John the Baptizer's final testimony about Jesus is consistent with what he said at the beginning of his ministry. He knew his role as the "the best man" to the groom—that is, Jesus (verses 27-28). John's own disciples were jealous of Jesus but John set the record straight for them— He must increase... I must decrease. John's testimony is what every follower of Jesus ought to hold true in their heart. A true encounter with Jesus and His grace is a humbling experience. We realize who He is and our place as a believer. As John said, "(He) is from above... I (am) from the earth (verse 31). John's testimony at the end of this chapter (3) ties into the conversation of Jesus and Nicodemus at the beginning. Jesus told Nicodemus of his (and our) need to be born from above. It's an invitation to enter into a personal trust relationship with the Lord. But there's a caveat. Whoever rejects trusting in Jesus will not receive eternal life. Rejecting a relationship with the Lord means continuing in a self-focused life. There is no upside to this choice. It brings exclusion from God's kingdom—His domain of gracious love and eternal life. This is a choice we all make at some point in life. If we're unwilling to go on a "self-diet," this choice is made by default. How is John's statement about decreasing in importance just as relevant for us now as it was for him then? How is it possible for us to decrease in importance so Jesus can increase in importance? In what way can this take place in your own life? 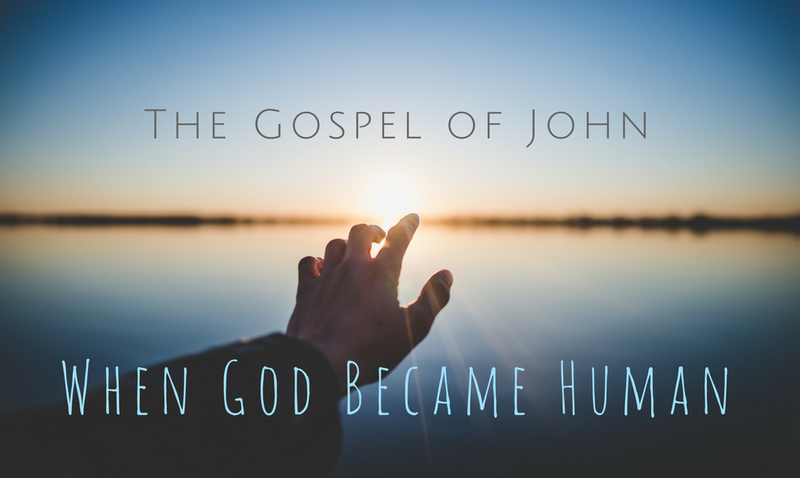 How can John's example guide you? Since this idea of decreasing our self importance is so opposite of what's common in our culture, what are specific steps that anyone can begin to take to do this? Meditate On This— A personal relationship with the Lord Jesus only comes through a personal encounter with God's grace. When we truly experience God's grace, it will bring a humility and desire for the Lord's nature to increase in us and our selfish nature to decrease. Prayer Focus— Does your heart desire and cry out for the Lord's nature to increase within you at the cost of your own selfish nature? If not, ask the Lord to work in your heart in a fresh way by His grace.